WoodWind Farm, a saddleseat riding facility, was established in 1980 by Bonnie Kittredge. No matter your skill level, we are eager to introduce you to the incredible world of horses. 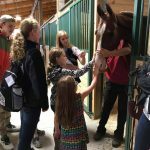 WoodWind operates as a full service training facility and lesson program which holds it’s lessons later in the day to accommodate our schedule for training horses or camps in the mornings. Catering to all ages and skill sets, we are able to teach year round in our comfortable indoor facilities. We also offer outdoor lessons for our intermediate and advanced students, weather permitting. Exceptions can be made for the hours below for select students based on schedule, homeschooling, and etc. Please speak to an instructor about your schedule situation and we will try to help! Scout and B-Day slots available! Or reserved for your scout or B-Day party! Be the first to know about new classes, events, and more. I consent to Woodwind Farm collecting my details through this form. 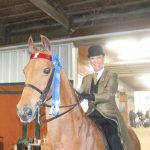 Join the Woodwind Farm Showstoppers at IASPHA Spring Horse Show in Gurnee, IL (at Fields and Fences Equestrian Complex) for a fun morning of Junior Judging. Check in at Woodwind Farm’s barn (entrance closest to Hunt Club Rd. or Far East side of the barn) to grab a “cheat sheet” to study what class names mean before you enter the show ring to judge. Sign up for junior judging at horse shows is usually in the show office or near the arena (with a nice lady with a clipboard and a large crowd around her). Check out of Junior Judging Information Sheet below! Our adult ride nights are always a great hit! 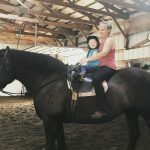 Our first of the warmer season will be for our more advanced riders (those who can confidently ride a horse by themselves). Enjoy some time out of the house with your favorite 4-legged friends! BYOB! Space is limited! Sign up on Facebook or at the barn! It’s time to shine and show off what you’ve been working on! 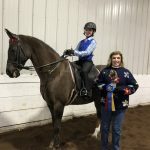 Whether you are new to the show ring, have done a few barn shows, or compete throughout the Mid-West circuit off the farm, practice your skills at the friendly but competitive Spring Barn Show! We will be offering classes from beginners all the way up to our suited riders to get ready for a great show season in 2019! Check out information on our challenge class as well! Join us at Woodwind Farm with a group of great people and riders for a fun night of horseback riding games! This is a great opportunity to sharpen your skills in a fun way and hang out with your new or old barn buddies! Welcome to those who can confidently ride by themselves. Snacks will be provided but feel free to bring something to share! Bring a friend during the week of May 6th-11th to join you during your lesson and you will each receive $5 off your regularly priced lesson! This is such a fun way to show your friends what you do for fun or sport! Want to bring 2 friends. Schedule another lesson during the week and receive $10 off your second lesson and your friend still gets $5 off of theirs! Limit of one friend per lesson (not applicable to Kids Ride Night). Friend must be a new rider at Woodwind! WoodWind operates as a full service training facility and lesson program. No matter your skill level, we are eager to introduce you to the incredible world of horses. © 2018 Woodwind Farms. All rights reserved.